It was back to March this year when SKP Resources announced the bonus share option, only I started to pay attention to this company and monitoring ever since then. Brieftly speaking, SKP Resource involves in plastic manufacturing especially on plastic ejection moulding and is renowned within the plastic industry which constantly maintains and deliver products and services of world class standard and quality. SKP Resource just announced its half year report for year 2013 fortnight ago and it showed that the contract it got from its main customer, Dyson is not one time deal. The business is just keep going. The revenue and net profit are constantly good for the past four quarters. It ables to achieve a half year EPS of 2.64 sen (after bonus shares issued). Foresee it can achieve a full year 5.2sen EPS for year 2013. Based on today price of 36.0sen, its PE is 36/5.2 = 6.9. Its price still has room to grow higher if I apply a PE of 8 or 10 into it which translates into 15 to 40% profit. Graph below shows the financial highlight for the past 5 years. Bear in mind that the EPS for the past 5 years are being calculated excluded the bonus share issued. It able to improve ever since the downturn in year 2009. Apart from that, its profit margin is around 10% which the cost of sales alone already accounted around 80% of its revenue. This is a point where the management team has to look at to improve the operation cost. Let's now take a look at its balance sheet, one thing to note is SKP Resources handles its financial really very well. Its gearing ratio is quite low. Another point is its borrowings or loan is extremely low or totally zero for the past 5 years. It takes no debt to generate income for the company. How nice is that. In terms of cash, it has RM88m cash in hands announced at the lastest quarter report. If we divide the RM88m cash by the number of shares (900,000,000), its cash per share is RM0.098. Image you buy 1000 lots today at RM0.36 to be a minor shareholder of this company. So, you paid RM360 for it, but you have close to RM100 cash in hands. Interesting, isn't it? You may doubt of its high amount of cash in hands as in other mean, the management team does not fully ultilise it cash to invest for future. But take a look at its ROE, it able to achieve an ROE >15 for year 2011 and 2012. It shows the management team able to bring a good return to its shareholders to at least 15%. Another point is SKP Resources adopts a policy of distributing at least 50% of its net profit as dividend to its shareholders. 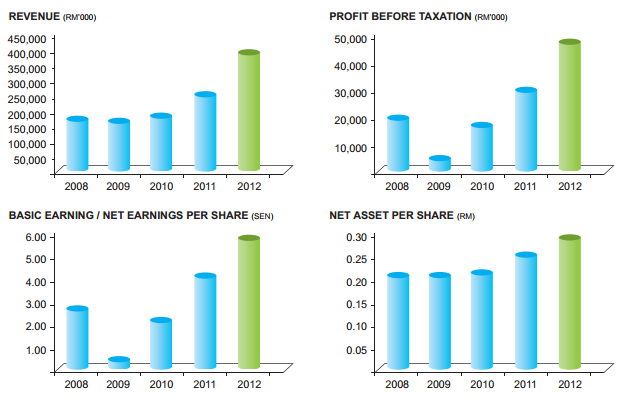 Foresee its EPS for year 2013 is 5.2sen, so it probably can give around 2.6sen as dividend to its shareholders. Base on today price, its dividend yield is 7.2% which far better than you put your money in to FD. But there is a bad side of this company as its main customer, Dyson contributes quite heavy of Skpress's total reveune. SKP will have a hard time if Dyson reduce its business with SKP. Since I cannot predict the future, just hold on to receive dividends and check the result quarterly to evaluate more. Hi, may I know actually how did you find out Dyson is the main customer/heavy biz contributor to SKPRES? Annual report didnt state. Please refer to OSK investment report on SKPress, Page 3. Below is the link. Sometimes, we need to depend on the investment bank report analysis as they have the privilege to have a meeting with the management team unless we have the time to attend the AGM meeting to raise our questions. Beside that, you can get additional info like SKPress intends to spend RM30m to expand its production faciliy on next 2 years. Hi, appreciate your perception on the recent founder shares disposal. Frankly speaking, I have no idea on why the founder disposed his shares in hands. But all this shares disposal was done through married deal. The buyer might be someone big in order to have fund to keep buy from the Dato Gan. Last disposal transaction by Dato Gan was at 24 dec. So, he stops disposes his share for almost 4 weeks already.